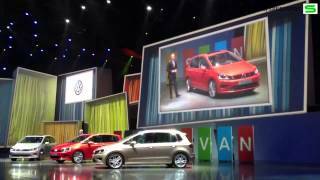 Volkswagen will have the world premiere of the Golf Sportsvan Concept along with the new Golf R and e-Golf at the 2013 Frankfurt Motor Show. The Golf Sportsvan is described as a minivan that offers more space for active recreation, family and work. The Golf Sportsvan concept car was created as the third body version of the model series, after the classic Golf hatchback and the Golf Estate, and it is based on the modular transverse matrix (MQB). It has a wheelbase of 2,685 mm, which is 107 mm longer than the Golf Plus. 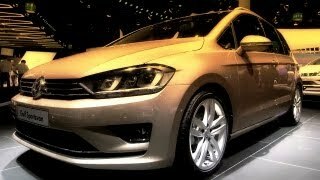 Compared to the hatchback Golf and the Golf Estate, the wheelbase has grown by around 50 mm. Compared to the previous model, cargo capacity was increased 74 litres to 498 litres (rear bench seat in standard position, which is 50 mm forward of the rear-most position). The Golf Sportsvan has an interior that is as high-end and stylistically sophisticated as it is clean and fresh. The dominant element here is the newly designed dashboard. There is now a centre console that is inclined towards the driver with a touchscreen, climate control switches and the gear shift. The Golf Sportsvan will be offered with a range of six new engines all equipped with a stop-start system and are up to 19 per cent more fuel-efficient. Outputs will be ranging from 85 HP (63 kW) to 150 HP (110 kW). 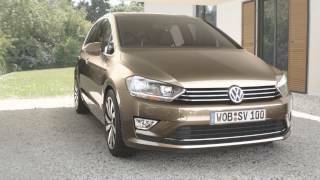 The most economical version is the 1.6 TDI BlueMotion with 110 HP (81 kW) which enables the Golf Sportsvan to have a fuel consumption of 3.7 liters / 100 km (63.5 mpg UK or 76.3 mpg US) with CO2 emissions of 95 g/km.